A billboard near the intersection of Monroe Street and Northwest Boulevard slams Spokane City Councilmembers Breean Beggs and Candace Mumm for being supportive of the Monroe Street lane reduction. The opportunity for opponents of the city's plan to reduce the number of lanes on the 1.12-mile stretch of North Monroe Street between Kiernan and Indiana avenues appears to have already passed. "We announced back in April that we are moving ahead with the project. It’s now in design. We’re moving ahead," city spokeswoman Marlene Feist says. "We're not going back to this discussion again." That doesn't mean that the opponents to the lane reduction are giving up. If anything, they're upping their rhetoric, attempting to attach a political price to supporters of the North Monroe road diet project. 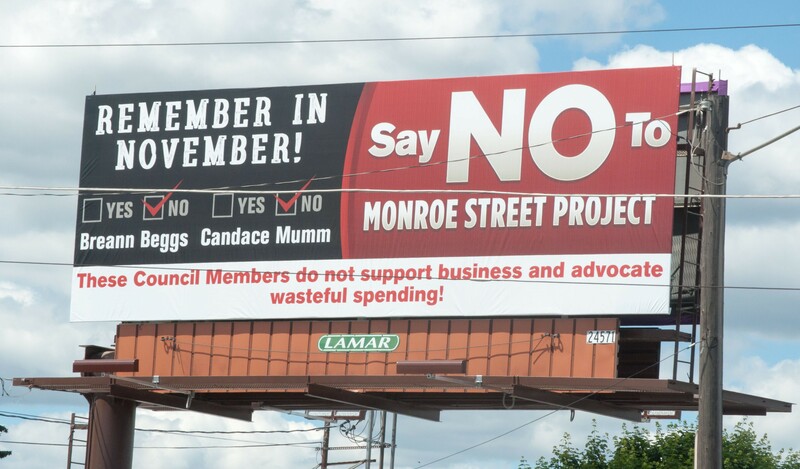 The Monroe Street Business Association has put up a billboard urging voters to "Remember in November!" that Councilmembers Breean Beggs and Candace Mumm "do not support business" and that they "advocate wasteful spending." "We're just putting councilmembers on notice who don’t believe in businesses that they're going to have a hard time getting re-elected in the fall," says Gary Jarvis, president of the Monroe Street Business Association, a group that formed in opposition to the lane reduction. For more than a year, they've been warning of traffic jams and shuttered businesses if the five lanes on that section of Monroe are reduced to three. The billboard is just north of the corner of Monroe Street and Northwest Boulevard, above Bellwether Brewing — which is one of the businesses ardently backing the Monroe Street road diet. But here's the thing: Beggs — whose first name is spelled wrong on the sign — and Mumm didn't technically vote for the Monroe Street lane reduction. "It’s an administration initiative. The council hasn’t proposed or led or asked to vote on anything," Beggs says. "All I can imagine is whoever paid for [the billboard] is not happy, and we’re the two who are up for election." While the council worked on a formula that the administration would use for projects like the improvements to Monroe, Beggs says, that wasn't just specific to Monroe Street. Rather, it was the city's staff who decided to apply for the $4.1 million grant to make the section of Monroe safer. Mumm notes that, because of the ensuing controversy, the council passed a rule requiring council approval before pursuing such a grant. And it was the city administration, not the council, that decided to move forward on the project over objections from some businesses. "I know they're disappointed," Mumm says about opponents of the projects. "They would like it would be an up or down [vote]... But the council has never voted on any individual street projects like that." It's not as if either Beggs or Mumm passionately opposed the lane reduction, either. Both are largely supportive of it, though they also recognize genuine concerns of some of the nearby businesses. "I don’t want to see anybody else die on Monroe. I don’t want to see anybody else injured on Monroe," Mumm says. "Public safety is paramount." Similarly, while Beggs has concerns about the impact of the construction on local businesses, he feels the long-term results will be positive. "I think one thing people forget is that it’s only for a few blocks. It’s really a very short segment," Beggs says. "It seems like it's more of a fear-based opposition than a data-based opposition." Supporters, including several younger business owners, point to the variety of other improvements associated with the project, including wider sidewalks, street trees, and more spacious parking spots. In particular, Mumm is bothered by the allegation she's anti-business. "They have to understand that my family was one of the very first businesses on Monroe," Mumm says. "My parents opened the Taco Time in 1966. Monroe was very vibrant. We could walk across the street safely." She says she went door-to-door to involve businesses in the discussions around the Monroe Street lane reduction. "After we heard from business owners who had concerns, we formed a task group with the administration," Mumm says. "We met many times trying to coordinate their concerns with the project." While the city opted to move forward with the project despite the fears of some businesses and property owners, Feist says that the city's design engineers will be talking to individual property owners to make sure the impact on businesses will be minimal. Both Beggs and Mumm say they want to look for ways to protect businesses from lost sales during construction. Just yesterday, Mumm says, she met with the mayor to discuss the issue. "The goal is to try to keep the disruption to any business to less than two months," Mumm says. " We need to try to make sure pedestrian access is allowed almost the entire time if possible." Meanwhile, there appears to be at least one campaign-finance problem with the billboard. According to the Public Disclosure Commission, such a billboard clearly targeting two members of political office is required to have, at minimum, a name and an address explaining who the billboard is sponsored by. The Monroe Street billboard doesn't. Kim Bradford, spokeswoman for the PDC, says that Jarvis' group would also have to report the spending in some way, whether by reporting it as an electioneering communication, independent expenditure or in-kind contribution to Beggs' or Mumm's primary opponents. For now, Jarvis declines to get into the details about the strategy surrounding the billboard. Instead, he teases the idea that the billboard won't be the only tactic his anti-lane-reduction group will pursue in the coming weeks. "Just in the next few weeks, there's a whole lot of new stuff coming out that’s fun and exciting," Jarvis says. "We do have some pretty big things coming down the pipeline. I’m sure you’ ll see it. It won’t be long." How would Stuckart's campaign finance proposals affect a run for mayor?